This battery is truly a Monster. This AGM 8D battery is perfect for the Transportation Industry for the new on board Heating and Air conditioning units. 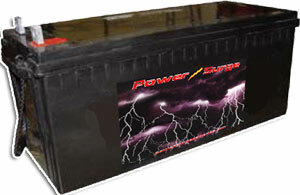 This battery allows for the powerful 12 volt battery to give that 10 hour off time period of power for the drivers. If you are looking to go big for storage or maximum IT back-up, then you have found the battery to fill your needs!